Less Than One Cent Per Cup of Coffee: Is That Fair? The other day my husband and I went out to dinner with our next door neighbor. He's always been a genuinely nice guy to whom we've enjoyed living adjacent for several reasons. I see you, smugly smiling over your morning cup of fair-trade coffee, gratified at the unimaginable impact your thoughtfully chosen beans must be bringing to poor coffee growers overseas. Well, think again. Low prices coupled with coffee rust is threatening the livelihoods of many farmers in Central America. Consumers are paying more for coffee; producers are getting paid less; and those in the middle are making money from both. In October 2012, when Hershey's announced it would "certify" all its cocoa by 2020, the corporate candy giant received lukewarm applause for finally publically acknowledging its sourcing of cocoa from plantations that exploit child labor. Do you drink coffee? Do you think about where that coffee comes from, and who harvests those beans? Do you consider how much you pay for your morning fix, and how that impacts the salary those farmers make? Fair trade is a term we often hear thrown around when it comes to coffee, tea, produce and even diamonds. What does it mean, though, and how much difference does buying fair-trade food and products really make? Throw your metaphorical corporate life out of the proverbial window and start afresh by sustaining the earth and its inhabitants. This is change we can believe in. Coffee: What Do Different Sustainable Coffee Certifications Mean? 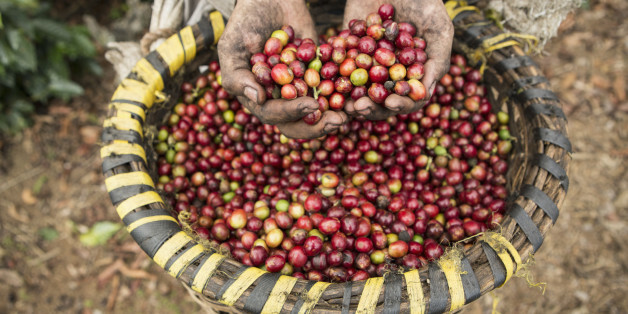 There are several "sustainable" certification labels that appear on coffee. I love coffee, but what do all those environmental coffee labels mean? Is one certification better than the other? Why does so much philosophy take place in bars and coffeehouses? What's the relationship between drinking and thinking? The idea of "fair" trade is very appealing, whether confronting the plight of autoworkers in Michigan or farmers in the Third World. Unfortunately, it will be only a small part of any trade solution for the U.S. and the world as a whole. Every day, citizens of our planet down 2.5 billion cups of coffee. Yearly, that's enough coffee filters, grounds and paper cups to circle the globe 55 times when placed end to end. By meeting with coffee farmers, an economic relationship can become a meaningful personal partnership of farmer, barista and customer. Hence, "relationship coffee." Where'd your morning joe come from? As the world awakens to social responsibility issues, many are now looking for a tasty and ethical brew in the morning. A expert panel gives their picks.